“Welcome to Nása Sámi moratorium.” The people who hiked up on the Nása Fell to look at the area where the company Elkem AS wants to start mining for quartz met this sign on their way. According to Ingemar Israelsson from the Svaipa Sámi village, quarrying would make it impossible to continue reindeer herding in the area. Reindeer herding or mining on Násafjäll? The question comes to a head now that the company Elkem AS has applied for expropriation in order to start quarrying for quartz in an area where three Swedish Sámi villages and a Norwegian reindeer-herding district practice reindeer herding. The company says it wants to hold a dialogue and reach mutual understanding and an agreement with the Sámi while it also sticks to its application for expropriation. 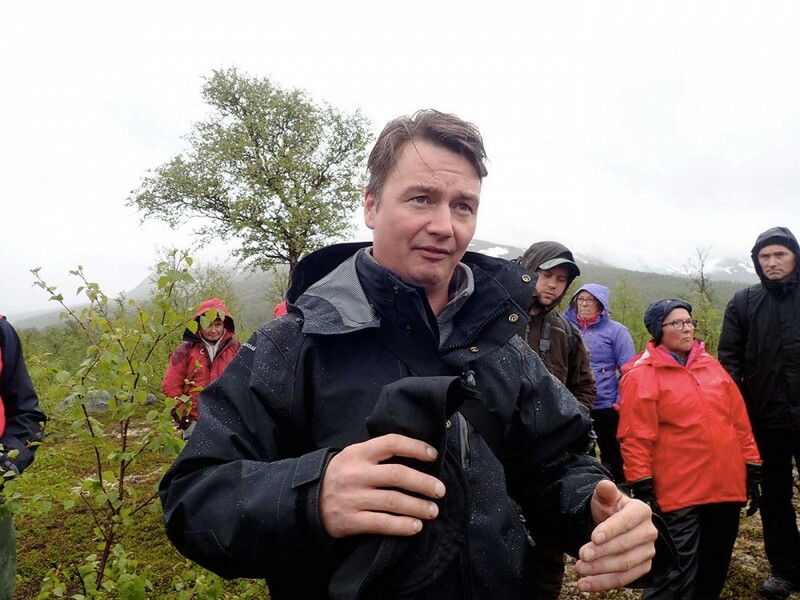 «I can already see that, with your present plans, there’s no way that we can use the fell for reindeer herding in future, responds Ingemar Israelsson,» Chair of the Svaipa Sámi village at an inspection of the area. 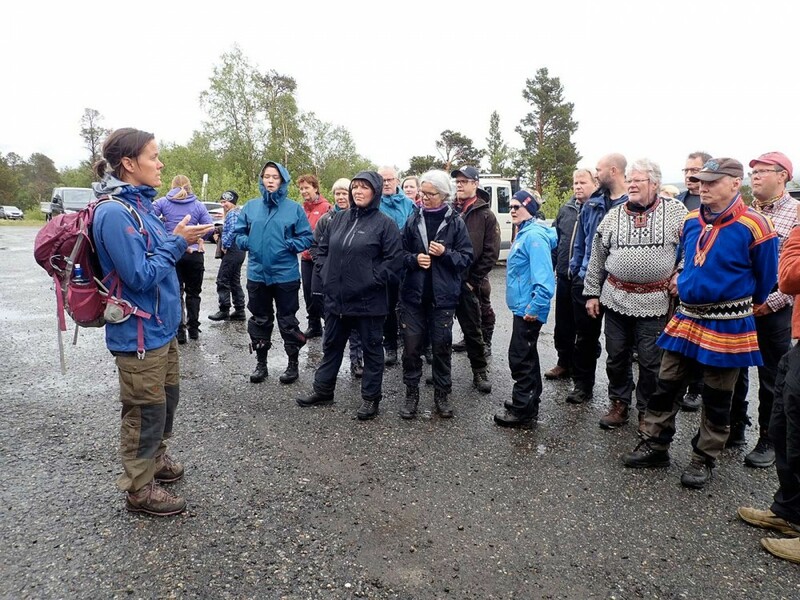 The fight for Násafjäll is not new but it became more heated on the 19th of June, when the Norwegian Ministry of Trade, Industry and Fisheries invited the different stakeholders to hike and inspect the area as a result of the expropriation application submitted by Elkem AS. The Sámi have declared a moratorium and self-government in the area, and, at a demonstration on the fell, they declared that no mining would be allowed in the area. «Today, you’re allowed to roam freely in our lands, but no mining will be allowed here, neither now nor any time in future,» said Sara Ajnnak, the spokeswoman of the demonstration. The area in question is situated on the Norwegian side of the border between Sweden and Norway, and is used for reindeer herding throughout the year by the Swedish Sámi villages Semisjaur–Njarg, Svaipa and Gran and the Norwegian Saltfjellet Reinbeitesdistrikt (Saltfjell Reindeer-Herding District). The place is near the former silver mine on Násafjäll, which is still, four hundred years after mining was stopped, a big environmental problem because of lead and arsenic in the waterways, for example. It is estimated that the area has one of the largest and most important quartz finds in Norway – a deposit that the company Elkem AS now wants to exploit. According to the company’s plans, mining will be carried out in an open quarry by blasting once a week. In the vicinity of the quarry, there will be a site for crushing the material to the size of 15–100 mm. An estimated 45 trucks per day, each with a load of 28 tonnes, will transport the crushed material away from the Nása Fell using a 7-km road that will be built from the quarry down to the main road E6. Mining operations will be carried out for 6–8 months each year, approximately for 30 years. In October 2017, Elkem AS submitted an application for expropriation of necessary rights in order to launch mining for quartz on the Nása Fell. In the application Elkem AS writes: “In a situation where it is, as of this date, completely unclear whether, and when, an agreement with the Saltfjell Reindeer-Herding District and the Sámi villages can be concluded on the use of the area, Elkem is now compelled to apply for expropriation and preliminary permission to start the operations.” According to the application, the mining operations will create 35–49 jobs. Representatives from Naturvernforbundet, Norske Samers Riksförbund, Svenska Samernas Riksförbund, the County Governor of Nordland and the municipality of Arjeplog participated in the inspection meeting and hike in the area, invited by the Norwegian Ministry of Trade, Industry and Fisheries. 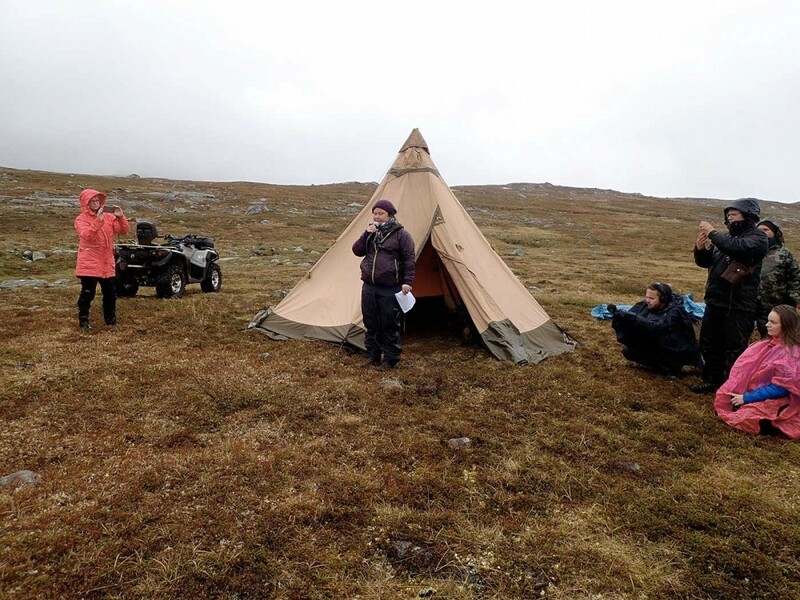 The meeting started at the Saltfjellet Hotell, where the company Elkem, the Sámi villages, the Reindeer-Herding District and other participants had an opportunity to present briefly their opinions on the issue. One of the first speakers was Ole Selsås from Elkem AS. He told that the quartz from Nása is of high quality and that the plan is to use it for the further development of solar cell products. He also emphasized the benefit of having the company’s smelting plants quite near, in Mo-i-Rana and in Bodø. Silje Ask Lundberg from Naturvernforbundet (Friends of the Earth Norway) agreed that it is eco-friendly to use rawmaterials from the neighborhood, but she also raised strong objections against mining. «You can’t look at eco-friendliness as an isolated phenomenon: we have to look at the project as a whole. Here, we’re talking about an area that is situated between a national park and a landscape protection area, and the Arctic fox has dens here. I’d also like to point out that the issue can’t be treated as a traditional conflict between trades, for that’s not what it is. Reindeer herding is not just an ordinary source of livelihood: it is much more,» Lundberg said. Per Thomas Kuhmunen from the Saltfjellet Reindeer-Herding District presented Násafjäll as an area that has been used for reindeer herding for thousands of years. Today, altogether 210 persons from 62 groups of herders are engaged in herding the numerous reindeer of the area. Kuhmunen also raised the concern that mining with its disturbancies and increased transportation will considerably scale up the reindeer that die as a result of traffic. Anders Erling Fjällås chose the perspective of the reindeer when he commented mining. «On the basis of our experience, we can assume that the reindeer will feel the vibrations that the blasts and heavy traffic created in the ground. The reindeer are going to both see and hear the blasts and the traffic. We have reason to assume that the reindeer will taste the wind-blown dust in the pasture plants. What will be the consequence of this? Presumably the reindeer will simply leave Násafjäll, and the area can no longer be used for reindeer herding,» Fjällås said. “I begin to understand how a boxer feels when he goes into survival mode, when he receives hits from every direction and has just enough strength to stand on his feet until the round is over and he can recover and keep on going in the next round.” Anders Erling Fjällås, Chair of the Semisjaur–Njarg Sámi village on the pressures directed at reindeer herders. The winter pasture in Västerbotten is threatened by wind power in Råliden, and the winter pasture in Norrbotten by mining plans in Laver, as are also the summer pastures in Násafjäll. Photo: Maria Söderberg. Per-Olof Nutti, Chair of the Sámi Parliament of Sweden, was one of the speakers who criticized insufficient distribution of information: – Information is the most important tool in such contexts. I’m the leader of my people, and I speak for them. Short-sighted exploiters must not ignore the need of Sámi livelihoods for land and waters. Of course, we also need the things that the mainstream society provides, but we do have a livelihood that must be respected. The field must have a right to get information and say no if exploitation infringes too much on the rights of the herders. Britta Flinkfeldt, a major representative of the municipality of Arjeplog, also commented on lack of information. She learned about the expropriation application from the Sámi villages, and was herself the one who informed the Provincial Board of Norrbotten about the issue. «We have not been asked to deal with this matter, which is strange because it concerns people who practice their livelihoods in the municipality. We’re also discussing an environmental impact assessment, as we on the Swedish side of the Nása Fell more or less have an environmental catastrophe in the old mine. After 400 years, the water is still not drinkable,» she said. 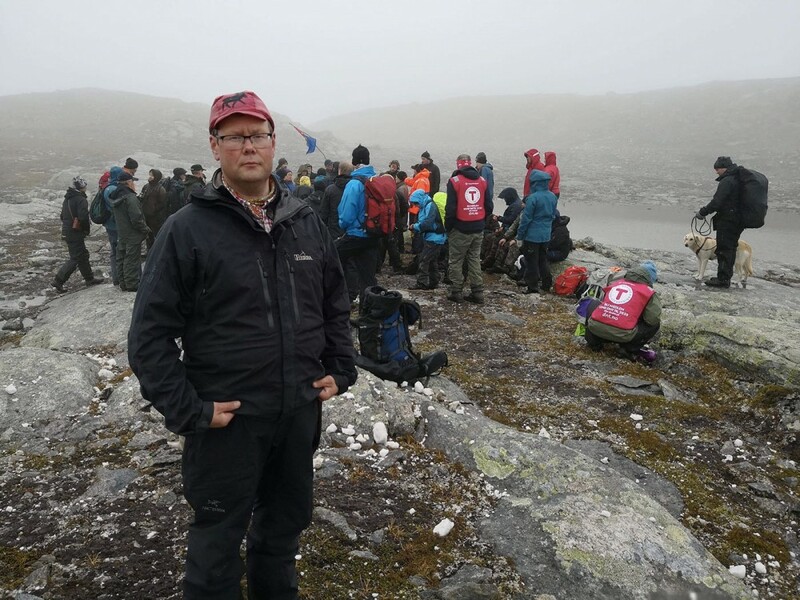 After the discussion, the participants of the inspection party set out on the Nása Fell in rainy, windy and foggy conditions in order to visit the site and see and try to understand how the area is being used now. The hike up on the fell and back down with a few stops for questions and discussion took about six hours. «This is a special fell, and I encourage you to look at the flora while you walk. The reindeer feeds on approximately 250 plants, and its main diet consists of 30–50 plants. You can find all of them here,» Ingemar Israelsson said. 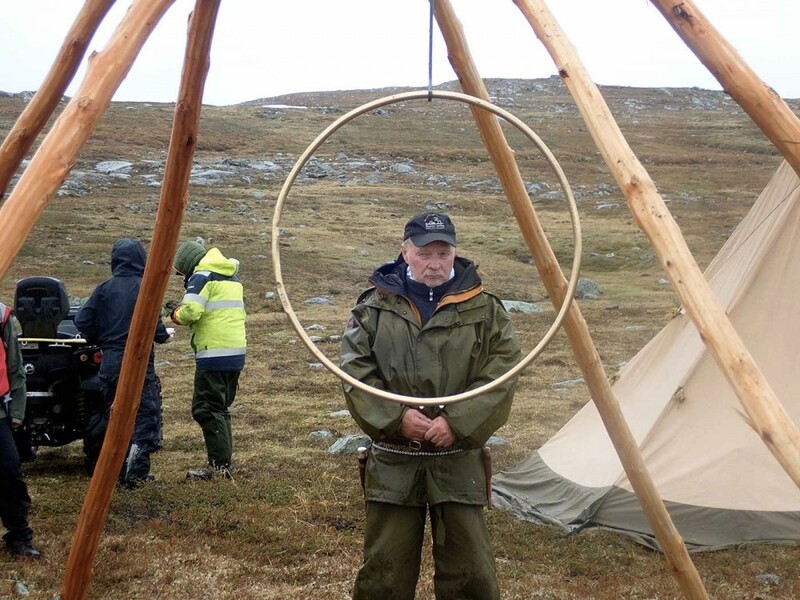 A group of Sámi had prepared a demonstration about halfway up the fell, setting up a symbolic monument with a big brass ring. There, Sara Ajnnak yoiked and spoke for the rights of the Sámi in the past, present and future. Olof Anders Kuhmunen hit the brass ring with his knife, and four reindeer suddenly appeared near the site of the ceremony. 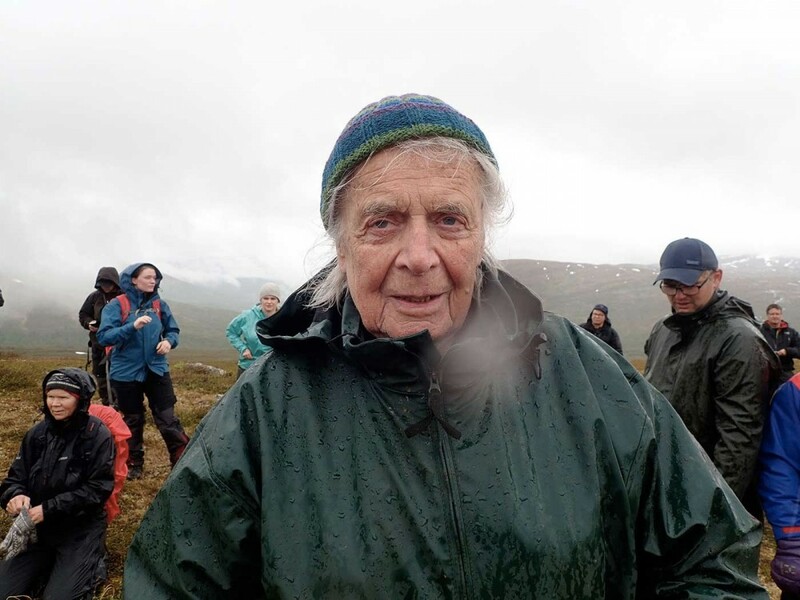 The demonstration on the fell was also attended by a man who can, also due to his age, be called an old and experienced fighter for Sámi rights: the 92-year-old Per Adde. He has gone to the barricades many times and fought for the sake of both Nature and the Sámi, for example, on the River Alta and also on the Saltfjellet Fells close to Násafjäll. He follows this struggle slightly more passively, but is still involved. «I don’t know whether anyone can stop a big international company, but I’m here today to show my support and maybe find a string or two to pull. This is an area where the Swedish and Norwegian reindeer meet and share the pasture, as if as a symbol for Sámi cooperation in the North Calotte, and it’s painful to think that this may not continue,» Adde said. Higher up on the fell, on the site where Elkem AS wants to start the quarry, the representatives of the company – Ole Selsås, Project Leader Geir Kjelland and Attorney Tor Gresseth – were asked many questions. Not all the questions were answered, and, as concerns the protest of the Sámi, the company completely refused to comment on it. Tor Gresseth, the lawyer of Elkem AS, explained that the company will now ignore what has happened so far, and look ahead and start a dialogue. Nevertheless, the company will not withdraw its expropriation application. «Elkem wants to meet you. We will sit down and try to find solutions to the challenges we have, and make an agreement; naturally, we hope for a peaceful solution. But we can’t stop the other line of action: if we don’t reach an agreement, we’ll go on with the expropriation process. That’s the usual way of dealing with matters of this kind,» he said. A study on the impact of the planned mining operations on reindeer husbandry will be finished in the fall of 2018. It is unclear what the consequencies will be for the Arctic fox, a red-listed species that is critically endangered both in Norway and Sweden.